Culturally Competent Practice 4 Edition CULTURALLY COMPETENT PRACTICE: A FRAMEWORK FOR UNDERSTANDING DIVERSE GROUPS & JUSTICE ISSUES will help you become a more informed helping professional through its strong tradition of presenting a model for understanding, measuring, and evaluating cultural competence. 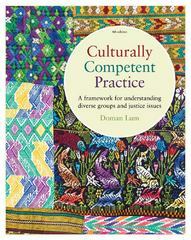 Author Doman Lum explains how clients and workers can become culturally competent and proficient by working through culturally based problems together. This text emphasizes cultural competence as a dialogical process and challenges students and professors to continue the conversation to achieve greater mutual understanding and social justice.